Your best bet is to simply Update Ubuntu to Ibex. If you can not do that for some reason here is a possible work around. 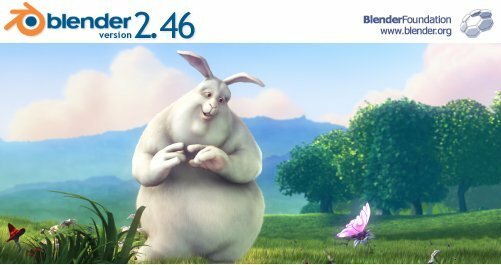 Because the W Grant repos do not contain the 64 bit blender anymore we have added this new post. This is an advanced technique for adding the latest Blender to Hardy Heron Ubuntu. Essentially the technique uses the APT-GET command to add the Intrepid Ibex Blender Package to Hardy Heron. NOTE: You would definitely want to use this trick at your own risk. According to rickyrockrat: “You are mixing repositories, so you can get into dependency hell. I’ve not personally had it happen, but never want it to. You’ll try to update one thing, and apt will grab the latest version, then it will start down the dependency tree. If you start to ‘fix’ this tree, you could wind up down a dark hole fast. Click the Add button and paste then click the Add Source button. Note: Be sure to un-check these two lines when you are done. Open the terminal: Applications > Accessories > Terminal. Follow the on screen instructions (we had to click “y” and then the “Enter” key). Once the program is installed and you should un-check the two Intrepid Ibex entries. If you do not, you could run into complications for your Ubuntu system. VitalBodies would like to thank rickyrockrat for sharing this technique! If you have Wifi near by, you can connect and simply Enable Blender. Applications > Add/Remove > All Open Source Applications > Search > Blender > Check the check box > Apply Changes. System > Administration > Software Sources > Password > Check the CDROM with Ubuntu 8.04 Hardy Heron > Close. And see if loads from the CD. Is your CD Ubuntu or Blender? I try this and work like a charm!. Is there any way to upgrade to 2.48a? One can always un-install Blender and down load and install the latest Blender from the Blender site. Otherwise, one can learn to package Blender for Ubuntu so all us ubuntu Blender heads can have the latest. If someone is already doing that then you have to check the repositories and see if that version is available and in what repository. Sometimes the new versions are, but you have to enable advanced Software Sources temporarily to make use of them. …And then un-enable. cool, it works and thanks you!